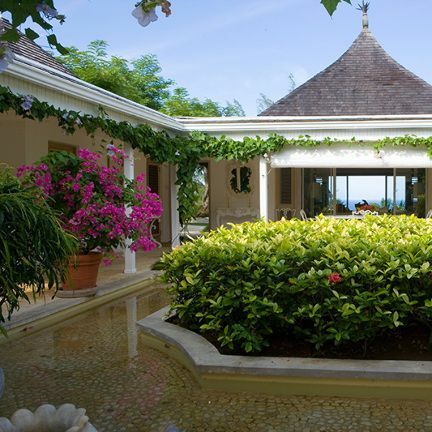 With stunning views of the ocean and the Montego Bay coastline, flower-filled gardens and sweeping lawns planted with specimen trees, Folly is an absolute charming place to be. One of Tryall’s original houses, having been owned by only 2 families, this villa is a much loved home and offers a truly unique escape for families or couples. Folly is located on the ridge of Barnes Hill, amidst 3 acres of well-manicured lawn and gardens. The Main House has the warm charm of a &quot;Casita&quot; - built on one level with covered walkways around flower-filled inner gardens that are frequented by humming birds and yellow banana quits. All bedrooms have en suite bathrooms and views of the ocean. Each is fitted with ceiling fans (no air-conditioning), which enhance the cross ventilation from the ocean and landward breezes, alleviating the need for air conditioning. There are two master bedrooms, one in the main house, and the second in a detached cottage a few steps from the main house. The master cottage is a restful retreat, sheltered by a large ficus tree. It offers a sunny view of shade-dappled lawn, the pool and the ocean. All bedrooms can be configured with king or twin beds as requested. Just a few steps from the living room, which is open on four sides, is the heated swimming pool. A table set up on the lawn provides the perfect spot for breakfast and lunch is usually served on the patio. The bar/study, with a daybed, provides space for those in need of quiet contemplation or an extra single bedroom with its own bathroom, which can also serve as a second bath to the master bedroom. Bibliophiles will be delighted with the selection of books, many having been brought by authors who have been Villa Folly guests. A staff of Cook, Housekeeper, laundress and gardener are there to take care of you during your stay.